Oil treatment with L’Oreal Paris is a new skin care cosmetic from this brand. Face oil Nutri-Gold is expected to nourish and provide vitality to skin. Thanks to eight oils with regenerative properties only few drops are enough for oil treatment with Nutri-Gold and to provide skin with nourishment and radiant look. The newest face oil from L’Oreal is a nourishing product combining within innovative areas of skin care with natural ingredients responsible for nourishment and moisture. Oil Treatment from L’Oreal Paris combines 8 natural regenerative oils, which ensure vitality and healthy skin. 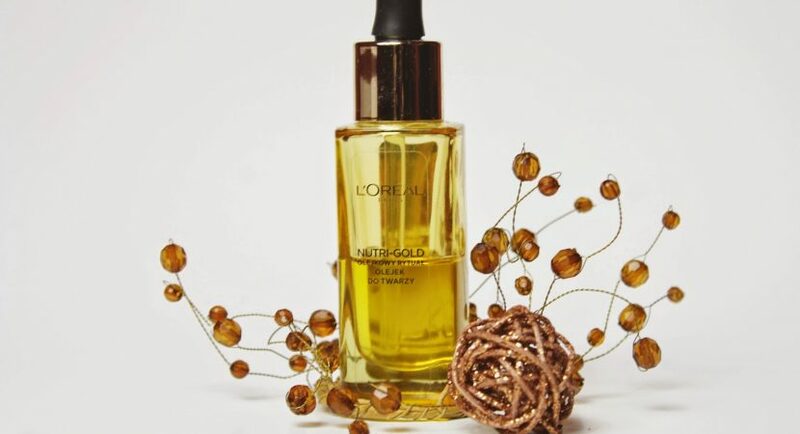 What oils will we find in L’Oreal Nutri-Gold oil treatment? Oil treatment is a complex of ingredients chosen in a way so application would be trouble free. L’Oreal offers many ways of oil application. Nutri-Gold is mainly everyday skin care oil. How is it possible? Oil treatment from L’Oreal Paris can be easily used in the morning or in the evening (but also at both times) for everyday skin nourishment. Beauty treatment can be performed on many ways – applied in stippling motion with finger tips, by rubbing in before day cream, or even as an aroma-therapeutical oil for evening face massage. L’Oreal Paris face oil is also an idea for special occasion. Manufacturer ensures that oil treatment can be performed on hundreds of ways and everyone of us should find their own. For example, Nutri-Gold oil can be added to our favourite cream as a support for skin care, as a nourishment directly on dry skin, as a highlighting addition to foundation or enriched nourishing formula in cleansing milk. There are many possibilities! How to take care of feet? Few practical advices.